Its been a few weeks since the floods in southern Alberta hit so unexpectedly and caused so much damage. There has been alot of coverage of the recovery efforts and all the incredible people that have contributed to these efforts. This post is going to focus on the role of Twitter and how important it was to the thousands of people in Calgary and surrounding areas including on a very personal level how critical it was for me considering I was in Halifax the day that this event was happening. Lastly – I want to highlight a very important moment with respect to Twitter and an unsung hero who was critical in ensuring that news and information kept going out to Calgarians. On June 20 I was in Halifax. I had the pleasure of speaking to our Atlantic Canada sales team. Throughout the day I was receiving updates from my wife with respect to weather warnings. By the end of the business day in Halifax the updates started to sound more critical with flood notices being issued and updates of more and more damage to the west of Calgary. By the time I had finished dinner with some of my YPG colleagues the updates where getting pretty serious with a number of communities in Calgary being evacuated and my neighbourhood was definitely on notice. (As an aside – check out Ristorante a Mano in Halifax, incredible restaurant). By the time I got back to hotel all hell it seemed was breaking loose in Calgary. 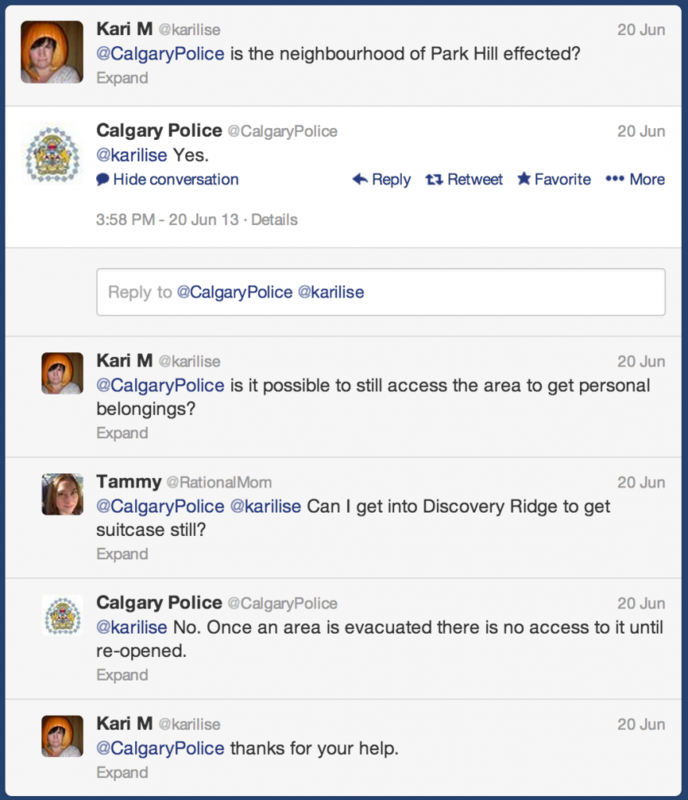 I immediately jumped onto Twitter and started to follow the #yycflood twitter stream. It was pretty evident from some of the early pictures that where being posted on Twitter that this flood was nothing compared to what happened in 2005. This is when I started to make the necessary changes to the travel plans to get back to Calgary as soon as possible, coordinating with my parents who live in downtown Calgary and helping to remotely make arrangements to ensure that everybody had a safe place to stay for the night in case of evacuations. 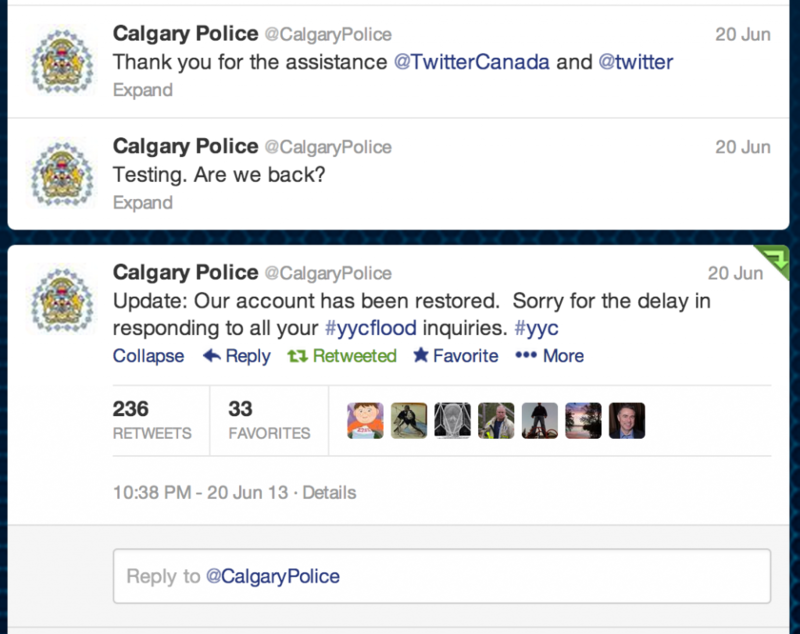 As the flood worsened and the volume of updates/responses to citizens increased, the twitter account for the @CalgaryPolice got shut down at around 7pm pst time. Considering the volume of tweets all of sudden from this account it would make sense that Twitter’s security system would halt this account. I know a lot of people got emotional when this happened (how could twitter shut this account down considering what is happening) but to be fair to them they monitor account activity and not context. The key at that moment was to get the @CalgaryPolice account back up and running to provide these critical updates to Calgarians. Below is a collection of images with time stamps on communications to get this twitter feed up and running again. 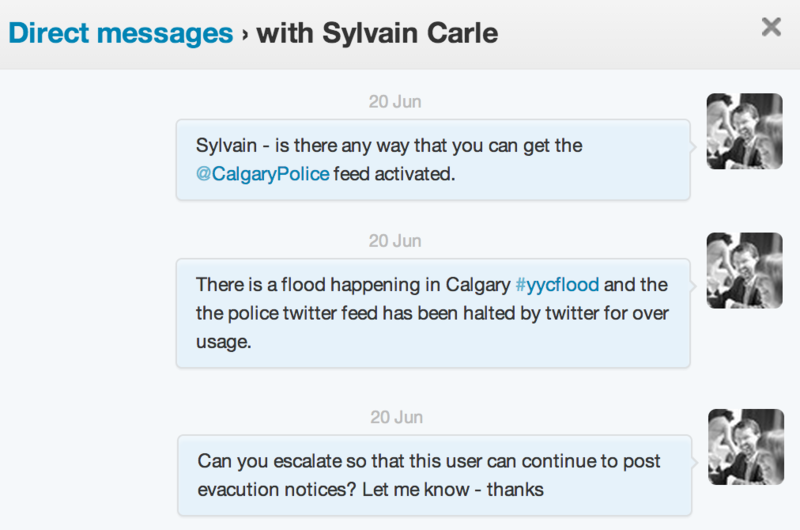 As you will see below, one of the unsung hero’s of the early moments of the Calgary Flood was Sylvain Carle, platform relations manager for Twitter. He was instrumental in making sure that the @calgarypolice twitter feed was back up and running in under 40 mins from the time it was blocked. After the reactivation of the account the @calgarypolice provided hundreds up dates on the 20th and 21st and answered hundreds of tweets of concerned residents. For me personally, twitter has always been a primary source of news information. However, until you go through an event where real-time communication becomes your life-line you don’t really appreciate how important Twitter’s platform is. When I think of the events of that night I am so impressed at how technology played an instrumental role in potentially saving life’s and calming the general public. Lastly, I would like to once again say thank you to Sylvain again for jumping into action. His efforts where critical in ensuring that communication continued to flow from the right sources and no doubt in my mind helped hundreds of Calgarians indirectly through his actions. Thanks Sylvain (@froginthevalley). P.S. – For another good read on Social Media’s role in the Calgary Flood, check out the blog post by Danielle Montgomery called Calgarians fight disaster with social media on the Edmonton Journal. This entry was posted in Twitter and tagged #yycflood, calgary, diaster, floods, social media, Twitter on July 15, 2013 by Darby Sieben.